I LOVE weddings, I always have. I honestly can’t resist the gorgeous flowers, the stunning wedding dresses, or the jaw dropping venues. But my favorite part, and I’m fully aware of how sappy this sounds, is that a wedding is all about love. There’s something so special in the way that a couple has chosen to express their love through their wedding. A couple could have a small or big wedding, simple or elegant, colorful or neutral, destination or local - whatever decisions the couple has made, it is all a reflection on how they feel about each other and their relationship. It does not matter how long I’ve been a photographer, I have always and will always get RIDICULOUSLY excited when I’m hired as the photographer for a wedding.There’s so much love, happiness, and beauty everywhere. Just imagine my excitement when I was contacted in early January of this year about a wedding this summer. I had the pleasure of sitting down with Matt and Shelby at a Starbucks in Avon to meet them in person and discuss their big day. When we sat down for our meeting, I started off by telling them about myself and the type of service they could expect. Ya know – the important, but oh so boring stuff. I then got to the fun part and asked about them and what they had planned for their wedding. When I started to learn about them and all the details of the wedding, I was completely blown away. There is just no other way to put it, Matt and Shelby are an absolutely adorable couple. I could just tell they are head over heels for each other. During our meeting, they shared that they met at the gym where Shelby challenged Matt to a push up contest, and that their guilty pleasure is DIY and house hunting. We may have gotten off track a few times, but I completely geek out over anything that makes me think of HGTV, so OF COURSE I had to ask about it, but I digress. The part that blew me away was the all of the thoughtful details of their wedding. I heard details like: serving doughnuts to guests before the ceremony and brunch afterwards with a mimosa bar, they were going to have a live band, and they were writing their own vows. Matt and Shelby also indicated that it was mostly important to them that Jami, my assistant photographer, and I capture the looks exchanged while Shelby walked down the aisle. All of the creative ideas and personal touches they had invested in their wedding left me feeling so excited and intrigued to see it all come together. Their big day finally came on July 23, 2016. Although it was a whopping 90 degrees, it was like the day was made for them. The sun was shining, there was a light breeze, and puffy white clouds. Needless to say, the venue was looking gorgeous. Jami, my amazing second photographer, and I arrived while the bride was having her makeup done. Shelby and her bridesmaids were extremely welcoming and relaxed as they sipped on mimosas and discussed their excitement for the wedding. While the girls finished putting on their makeup and their hair, Jami and I took a moment to document Shelby's dress, shoes, veil, and flowers. You could feel the emotion in the room as the bride began to put on her beautiful gown. The bride and groom were just a few moments from walking down the aisle. Matt and Shelby chose to exchange their vows by water with a beautiful fountain behind them. The bride and groom stood beneath an altar strung with beautiful pink flowers, and white drapes. While walking down the aisle there are three very important people to capture: the groom, the father of the bride, and most importantly the bride. 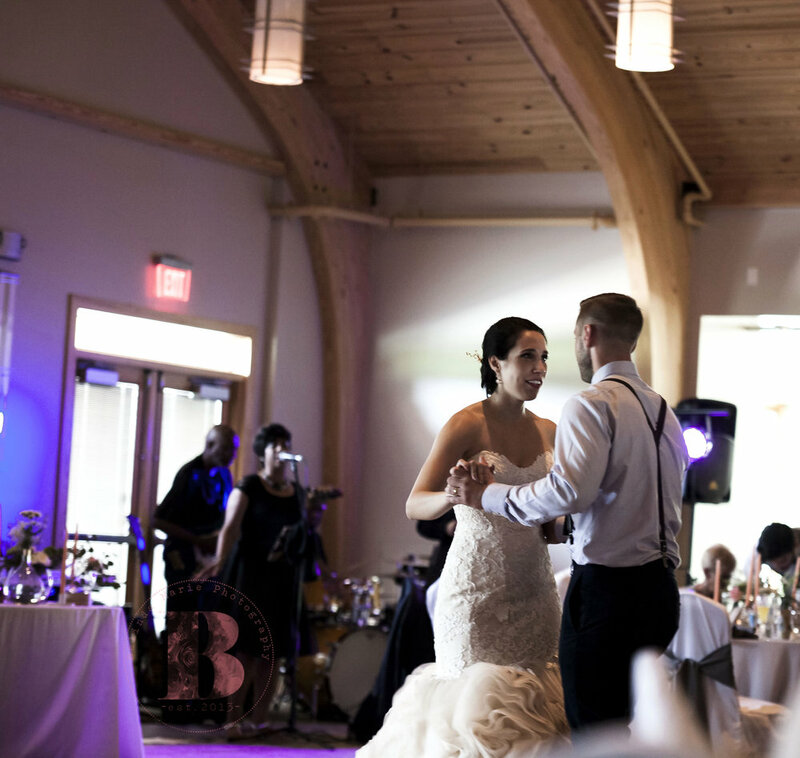 All three expressions were completely priceless.Matt’s eyes were locked on his bride and filled with so much love, Shelby’s father was grinning from ear to ear, and Shelby was so caught up in the emotion she couldn’t help but smile and cry tears of joy. Matt’s brother was waiting at the end of the aisle to marry them, just another personal touch I couldn’t help but love. In my job it could be very easy to check out on what is being said because you’re concentrating on making sure you provide enough coverage, but their vows were so sweet I couldn’t help but listen. I laughed when Shelby promised to watch Matt’s wrestling moves and Matt promised to let out the dog every other time. That’s true commitment. As the ceremony came to an end, we were off to take the posed portraits. I was so glad they let me convince them to take the two minute drive to a stunning bridge, that was my favorite area of the park. In the short amount of time we were by the bridge, there was dancing, kissing, and a lot of laughing. When we headed into the reception where the guests were enjoying the live music, a mimosa bar, and all the amazing details that Shelby and Matt put together. As guests were finishing their brunch – seriously, that bacon <3 - we heard heartfelt speeches from family. The speeches were so touching. It was amazing to hear all the love and support that the family has for this beautiful couple. Shortly after the speeches, guests watched as the couple shared their first dance. The wedding was concluded with Matt, Shelby, and their closest family and friends getting down on the dance floor. To share someone’s special day as a guest, vendor, or member of a bridal party is such an honor. I felt so privileged to meet such a sweet couple and photograph their gorgeous wedding. Cheers to the bride and groom!